Q. Should I put coconut back on my menu? 1. Coconut oil is the safest oil to use for cooking. Because coconut oil is a saturated fat, it is the least vulnerable, of all dietary oils, to oxidation and the formation of free radicals.1 Consuming oils that have oxidized from exposure to high temperatures can lead to many health problems – from heart disease to diabetes. 2. Coconut oil is a natural antibacterial, antiviral and anti-fungal food. 3. Virgin coconut oil can help prevent bone loss arising from osteoporosis. 4. Coconut oil provides energy to your body, without fat accumulation. The medium chain fatty acids (MCTs) found in coconut oil are used by your body to produce energy, rather than being stored as fat.5 Traditional sources of fat in the diet are broken down into individual fatty acids and then regrouped into bundles of fat and protein, called lipoproteins. These lipoproteins are sent into your bloodstream so that the fatty acids can be deposited into your fat cells. MCTs found in coconut oil are used differently in your body. Instead of being packaged into lipoproteins and circulated in your bloodstream, they are sent directly to your liver where they are converted into energy.6 These energy-producing fats do not raise blood sugar, like carbohydrates, so they are good a option for Diabetics. 5. Coconut oil can boost your metabolism. Coconut oil has a thermogenic (or calorie-burning) effect.7 This is because the MCTs in coconut oil are easily absorbed by the energy-producing organelles of your cells. Studies have shown that after eating a meal containing MCTs from coconut oil, your metabolism stays elevated for at least 24 hours!8 Not only will you be burning calories at a faster rate, you will have more energy. There are so many ways to use coconut! For thousands of years, coconut has served as a food source in warm climates. Once that brown outer husk of a coconut is opened, the flavourful meat provides important nutrition. Key benefits include weight balance, athletic performance enhancement, increased brain function and immune balance. It may even hold the key for reducing memory loss in the elderly! Fresh coconut is grated into coconut flakes that are dried to create tasty, portable snack products. Traditionally used in baking around the world, flaked coconut (also called dessicated) adds a nutty flavour to desserts, such as energy balls and date rolls. I suggest always opting for unsweetened dried products. Coconut flakes are found either in the bulk area or with baking supplies. When kept in an airtight package and a cool location, coconut flakes will stay good for 4 to 5 months. You can also keep them in the freezer for up to a year. Be careful to read the ingredients! Look for brands that are either unsweetened or sweetened with a natural syrup, such as coconut or rice syrup. When kept in an airtight package and a cool location, coconut flakes will stay good for 4 to 5 months. Don't freeze! Creamy coconut milk makes everything taste better! 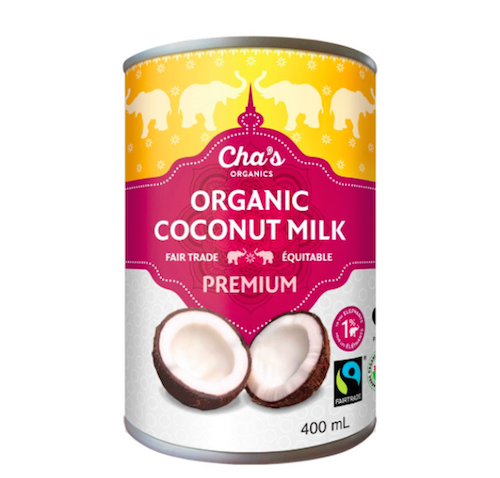 From curries to ice cream, coconut milk has been used instead of dairy to make a wide range of products. Some recipes call for just using the cream—the top layer of the milk—which means you place the can of coconut in the fridge overnight and then skim off the thicker part. Coconut Milk, usually canned, comes from the coconut flesh, which gets grated and boiled until a thick coconut milk/cream rises to the top. Most canned coconut milks contain a mixture of both thick cream, thin milk, as well as some water. There are full fat or “lite” options, the latter of which will give you a thinner cooking liquid. Click here to see my favourite brand. Found in the international foods aisle! Keep at room temperature until used. Once open, keep in an airtight container for up to 7 to 10 days in the refrigerator. Pour leftovers into an ice cube tray and freeze for future smoothies and shakes. Sayonara soy milk! Moooo-ve along cow’s milk… Unsweetened Coconut Milk Beverage is here! 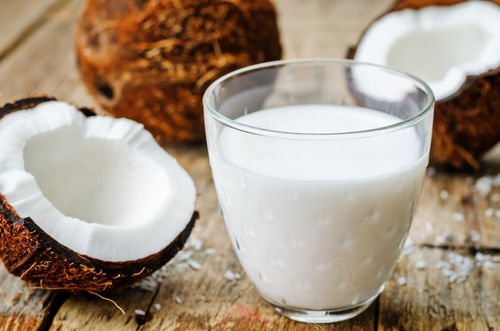 You can enjoy coconut beverage wherever regular milk is used, though you should know that it does not contain calcium and Vitamin D.
Stick with the unsweetened stuff, especially when using in a recipe (versus drinking it). It's good to look for a lower fat beverage that can be used like milk. Swap it 1:1 in any recipe that calls for cow milk. It's great for finishing soups. Click here for the recipe to make your own coconut beverage. This delicious beverage goes great on cereal, in coffee or for mixing into recipes. Look for beverage coconut milk in the refrigerated dairy section or the unrefrigerated, dairy-alternative section. If it's in a TetraPak, keep at room temperature until used. Once open, keep in an airtight container for up to 7 to 10 days in the refrigerator. Pour leftovers into an ice cube tray and freeze for future smoothies and shakes. Coconut water is the antiviral, antibacterial, anti-inflammatory and antioxidant, clear, nutrient-rich liquid inside a young, green coconut. The green husk has an inner white husk layered on top of the familiar hard, dark coconut shell. Once you crack through that shell, soft, white flesh and sweet clear liquid is revealed. Often coconuts are presented in stores in their cut and shaped white husk. 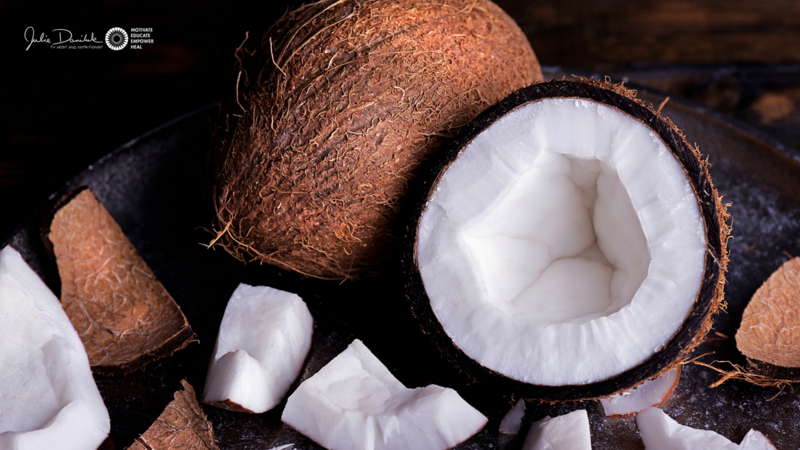 Be sure to avoid pink, grey or brown spots on the white husk as it can indicate that the coconut has gone rancid. Coconut water is a rich source of electrolytes that boosts your energy. It's full of potassium, calcium and chloride, which energize and replenish your body; and it contains much less sugar and sodium than commercial energy drinks. These electrolytes are important for muscle function, cardiovascular health, pain reduction, nervous system support and immune system function. Fresh young coconuts can be purchased in grocery store produce departments - usually with the green husk removed - and should be consumed once opened. Cans, bottles and TetraPak containers of coconut water can be found in the drink aisle, healthfood aisle or international foods aisle. Be sure to avoid added flavours and added sugar; while fresh is best, as long as you buy the most natural, non-flavoured water, you will get most of its beneficial minerals. Store canned or bottled drink water at room temperature and refrigerate once opened; consume within 24 to 48 hours. Raw coconut nectar is a low-glycemic sweetener which comes from evaporating, at low temperatures, the sap from the thick stalks or stems of a flowering coconut blossom. 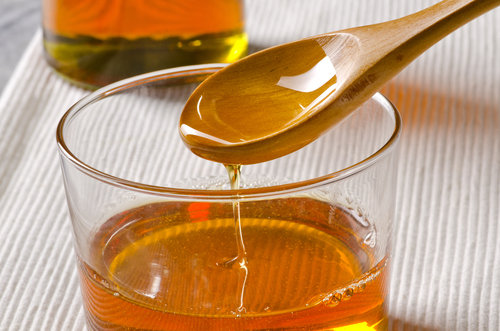 The nectar becomes a pourable syrup that is raw and low glycemic, as well as nutrient-rich. Coconut nectar contains all 9 essential amino acids, which are the building blocks of protein, although there is only a trace amount of methionine present. Proteins are part of every living cell in your body. Some amino acids play a part in repairing tissue, while others serve as neurotransmitters, transmitting messages within your brain, and some are even utilized in detoxification and metabolic functions. Coconut nectar contains 8 non-essential amino acids, plus it’s loaded with minerals (such as potassium, magnesium, zinc and iron), B vitamins and polysaccharide inulin, a prebiotic fibre that aids in the process of digestion. Use coconut nectar to sweeten hot teas, drinks, shakes, smoothies and desserts. Coconut nectar can usually be purchased at most health food stores or online. Read the label carefully for organic and non-GMO; aim for raw, too! Store at room temperature and, preferrably, in glass. Coconut sugar is also from the sap of coconut palm tree blossoms. It’s similar in taste and colour to brown sugar with an almost-caramel flavour, so it doesn’t impart a coconut flavour to baked goods. At a glycemic index of 35 it is lower than agave (42), honey (55) and cane sugar (68), you can swap it for granulated sugar in recipes or anywhere else you’d use sugar. Replace white sugar 1:1 with coconut sugar, keeping in mind that coconut sugar produces drier results. 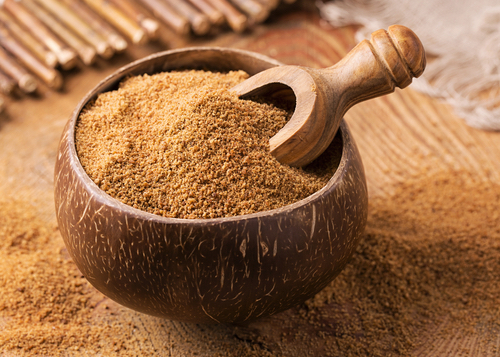 Find coconut sugar in most health food store baking sections or online. Once opened, keep in an airtight container or in a cool, dry area of your kitchen. 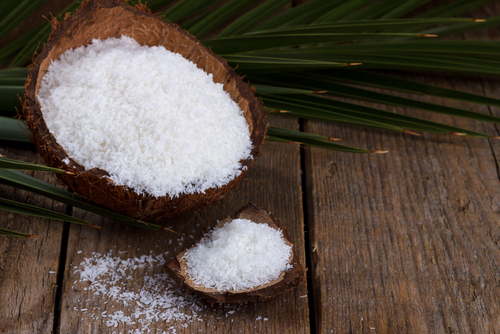 The sap used to make coconut vinegar comes from coconut trees grown in volcanic soil rich with minerals – potassium, iron, magnesium, sulfur, boron, zinc and manganese. It is especially rich in potassium, important for balancing electrolytes, controlling high blood pressure and metabolizing sugar. 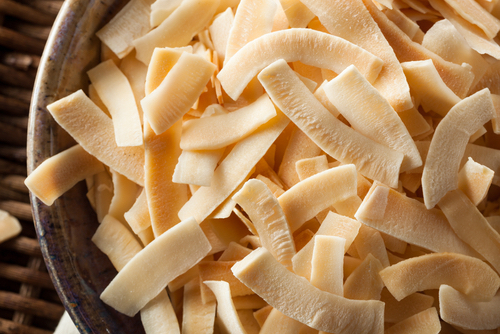 Plus, coconut vinegar has only 5 calories per tablespoon and can really add flavour to your meal. 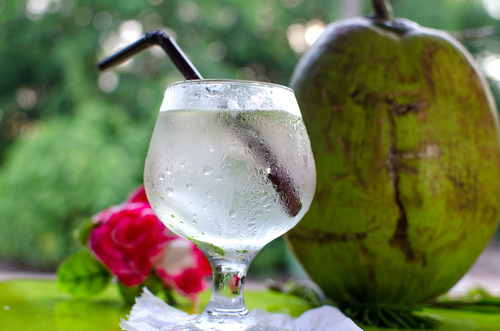 Try sprinkling coconut vinegar into sparkling water as a refreshing mocktail or use it in salads, and their dressings. Coconut vinegar can usually be purchased at most health food stores or online. Delicious, soy-free gluten-free seasoning sauce made with nutrient-dense coconut 'sap' from coconut blossoms, it's dark, rich, salty and slightly sweet (like umami), resembling light soy sauce or tamari. Due to the way it's processed, it remains raw and enzymatically alive – which means it's better for you! 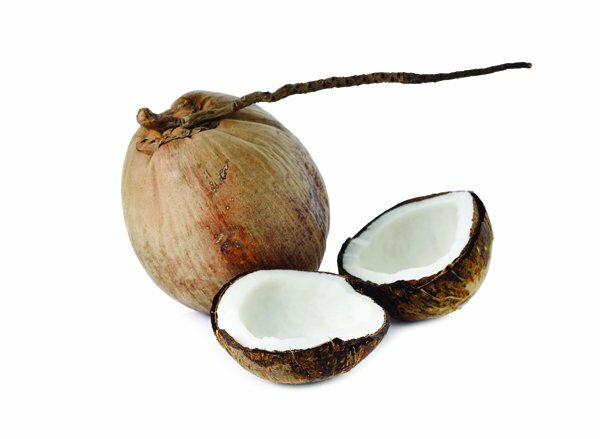 Coconut aminos is very low glycemic (35), is an abundant source of 17 amino acids (vital for muscle repair, brain and nervous system function), minerals, Vitamin C, broad-spectrum B vitamins, and has a nearly neutral pH. 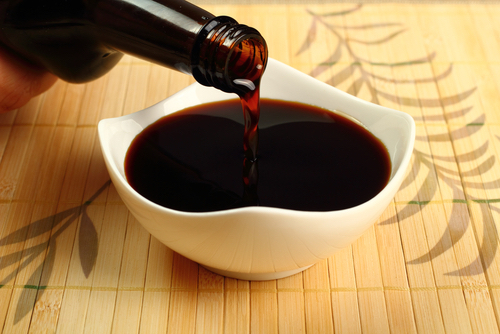 Coconut aminos can be used anywhere you enjoy soy sauce or tamari – salad dressings, marinades, stir-fries, soups and stews. Try the fine, soft texture of 100% certified organic coconut flour, made from non-heated, tumbler-dried coconut meat (with the oils already pressed out). It contains 40% dietary fibre and tastes absolutely delicious... lending a slight coconut flavour to your recipes! When baking, do not substitute coconut flour 1:1 in recipes. You need 1/4 to 1/3 coconut flour for every 1 cup of wheat or grain flour. To combat dry and dense results, add extra liquid in the form of more eggs (or egg substitutes) and a dairy substitute (like coconut milk). As a general rule of thumb, use an equal ratio of liquid to coconut flour. 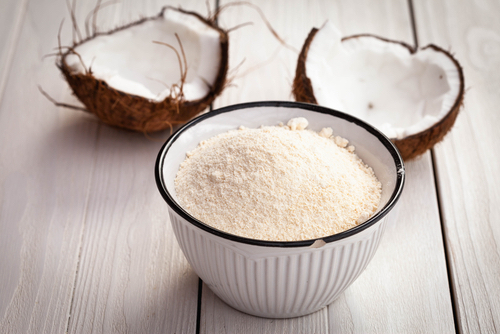 Coconut flour will be with alternative flours in the baking aisle or bulk bins, and online. Keep coconut flour fresh by storing it in an airtight container in the refrigerator or freezer. Like other flours, it generally has a shelf-life of a year. Coconut oil is by far the most confusing of the coconut products, as there are a slew of labels and varieties. All coconut oil comes from coconut meat, how it gets extracted is where we get differences in quality and usage. Refined coconut oil gets bleached for sanitation purposes and deodorized to neutralize taste and smell. Read labels carefully because some companies use chemicals to extract more oil and elongate shelf-life, while others use all natural processes (like clay bleaching and steaming) and physical means of extraction to achieve similar results. Refined coconut oil has a high smoke point (about 400°F) and neutral taste. Virgin oil (also labelled as “pure” or “unrefined”) starts with raw coconut meat, which gets quickly dried before expelling the oil or pressed to make coconut milk, which gets separated and strained to extract the oil—no bleaching or deodorizing necessary. Virgin oil – there's no difference between “Extra Virgin Coconut Oil” and “Virgin Coconut Oil” – has a medium smoke point (about 280°F) and a richer coconut flavour. Labels that say “cold-pressed”, “expeller-pressed” and “centrifuged,” refer to methods of extraction. 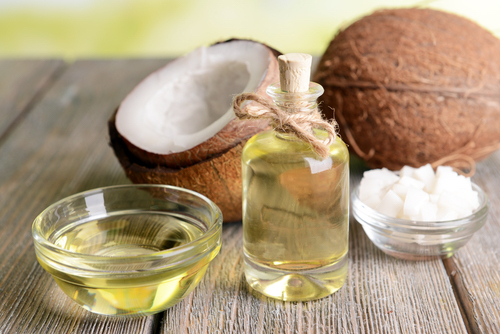 Long scorned as being a saturated fat, coconut (& MCT) oil shines for weight loss! MCTs are Medium-Chain Triglycerides (or Medium-Chain Fatty Acids aka MCFAs) and have many health benefits, including improved cognitive and cardiovascular function, improved energy and weight loss. Coconut oil is an excellent source of MCTs as 60% of the fatty acids in coconut oil are MCTs. MCT fats are easy to digest as they are sent directly to your liver, where they have a thermogenic effect and the ability to positively alter your metabolism. This is why experts say that the MCTs in coconut oil are burned by the body for energy, or “fuel,” instead of being stored as fat. On the neurodegenerative diseases front (such as Alzheimer’s disease and dementias), the oxidation of MCFA results in the formation of ketone bodies, which appear to increase cognitive function by offering a necessary and instant fuel source to the brain. Slightly sweet and nutty, coconut oil works in a 1:1 ratio in any recipe that calls for butter or oil. Coconut oil is solid at room temperature, so it works as a shortening substitute; simply swap 1 part shortening with 3/4 coconut oil. 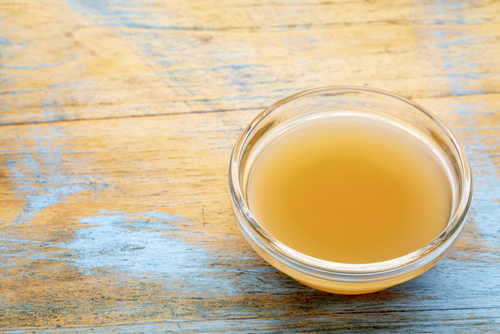 To melt coconut oil, place measured amount in a small bowl and submerge the bottom in warm water. Coconut oil will stay good and solid at room temperature for two years, stored in a cool area, far from your oven or a sunny counter. Coconut butter (also known as coconut manna) is coconut oil and coconut meat ground together, providing a rich coconut flavour that feels waxy when cold and creamy when warm. I suggest using coconut butter in your raw treats such as smoothies, instead of cooking. Find coconut butter with nut butters or in the baked goods aisle. Or, make your own. Coconut butter is solid at room temperature, though the oil and fatty parts may separate. To combine, simply warm the whole jar in a bowl of warm water & stir together. Coconut oil has tremendous topical benefits. Due to its anti-microbial effect, it works well to kill bacteria and yeast, will moisturize your whole body and can even double as a shaving cream. Try this : Apply a quarter-size dollop to your hair for a deep moisturizing oil treatment! Tarmizi AH, Lin SW: “Quality assessment of palm products upon prolonged heat treatment.” J Oleo Sci. 2008;57(12):639-48. DebMandal M, Mandal S: “Coconut (Cocos nucifera L.: Arecaceae): in health promotion and disease prevention.” Asian Pac J Trop Med. 2011 Mar;4(3):241-7. doi: 10.1016/S1995-7645(11)60078-3. Epub 2011 Apr 12. Hayatullina Z, Muhammad N, Mohamed N, Soelaiman IN: “Virgin coconut oil supplementation prevents bone loss in osteoporosis rat model.” Evid Based Complement Alternat Med. 2012;2012:237236. Epub 2012 Sep 16. Roodenburg AJ, Leenen R, van het Hof KH, Weststrate JA, Tijburg LB: "Amount of fat in the diet affects bioavailability of lutein esters but not of alpha-carotene, beta-carotene, and vitamin E in humans." Am J Clin Nutr. 2000 May;71(5):1187-93. Roodenburg AJ, Leenen R, van het Hof KH, Weststrate JA, Tijburg LB. : “Amount of fat in the diet affects bioavailability of lutein esters but not of alpha-carotene, beta-carotene, and vitamin E in humans.” Am J Clin Nutr. 2000 May;71(5):1187-93. Takeuchi H, Sekine S, Kojima K, Aoyama T: “The application of medium-chain fatty acids: edible oil with a suppressing effect on body fat accumulation.” Asia Pac J Clin Nutr. 2008;17 Suppl 1:320-3. Kasai M, Nosaka N, Maki H, Negishi S, Aoyama T, Nakamura M, Suzuki Y, Tsuji H, Uto H, Okazaki M, Kondo K.: “Effect of dietary medium- and long-chain triacylglycerols (MLCT) on accumulation of body fat in healthy humans.” Asia Pac J Clin Nutr. 2003;12(2):151-60. Baba N, Bracco EF, Hashim SA. : “Enhanced thermogenesis and diminished deposition of fat in response to overfeeding with diet containing medium chain triglyceride.” Am J Clin Nutr. 1982 Apr;35(4):678-82.